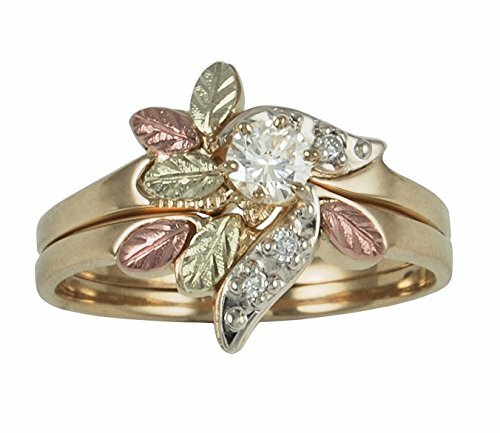 Diamond engagement ring is made in 10k yellow gold accented with 12k rose and green gold leaves. The diamond is a perfect expression; reflecting rarity, brilliance and breathtaking fire of a gem which survived a journey of billions of years. Symbol of devotion, honor and strength, the elegance of a diamond makes it perfect for life's important occasions. It is the April birthstone, Aries and Pisces gemstone, and great for any anniversary. Whether you treat yourself or gift this, it will be a keepsake for generations. This contains no nickel; it's gentle on sensitive skin. According to legend, French goldsmith, Henri LeBeau got lost in the Black Hills of South Dakota in the 1870s gold rush. He fell asleep thinking he was dying of thirst and starvation. He dreamed he saw a mountain stream with grapevines growing on its banks. He woke and walked over a rise to see the stream and grapevines in his dream. In gratitude, he dedicated his life and talents to creating jewelry in the shapes of grape clusters and leaves fashioned in rose, green and yellow gold. Upon ordering, the jewelers in South Dakota start crafting your ring. From the casting to the hand-placed, hand-engraved leaves, it's one of the most labor intensive styles of jewelry. Today, a series of up to 40 different steps are necessary to capture the same dramatic detail in the traditional and contemporary Black Hills Gold designs. The rising price of gold makes this, quite simply, a great investment.